Many were disappointed when French video game company Ubisoft revealed that no major Assassin’s Creed game would be released in 2016. But thankfully the series will be making a return this year, and we already know that the next game in the franchise, Assassin’s Creed Origins, will be hitting shelves on October 27 this year. And Origins’ first gameplay trailer aired on Sunday ahead of the E3 show, showcasing the upcoming game’s Egyptian setting, which surely looks fantastic in the trailer below. So despite plenty of speculation about where Assassin’s Creed could go next (some had suggested feudal Japan or India could be the next Creed setting), in the end this game will be set in ancient Egypt. 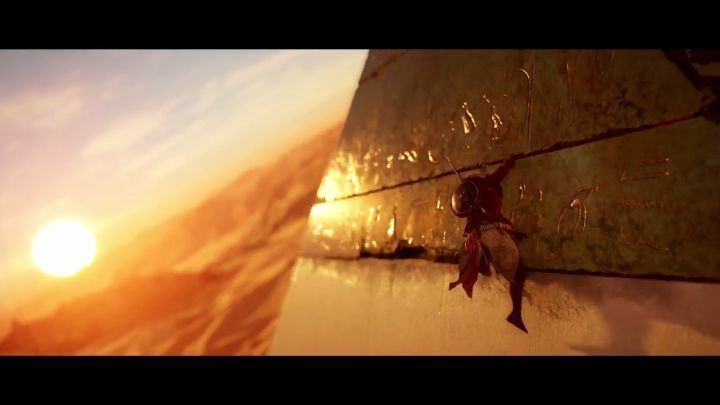 This means that amongst other things, we’ll finally get to climb the pyramids in an Assassin’s Creed game (and main character Bayek is seen doing just that in the trailer). Also, since the team behind the great pirate-themed Black Flag is behind Origins, it’s almost a certainty we will get to sail the Nile river here too. But aside from enjoying the amazing pharaonic architecture and other landmarks of Egypt, the trailer also shows the new combat system in action, with main character Bayek taking part in gladiatorial combat in an arena, shooting arrows on horseback and even fighting a giant snake similar to the ones seen in last year’s Gods of Egypt movie. And hopefully combat will be a strong point in this Assassin’s Creed game, something which would be welcome taking into account that it’s always been a sore point in earlier Assassin’s Creed games. It is still early to say whether this reboot of the series will be as great as fans are hoping it will be. After all, we’ve seen that Ubisoft can take the wrong step in the past with the likes of Assassin’s Creed Unity, so it would be a great thing if Assassin’s Creed Origins turns out to be a glorious return to form for the much-loved series when it debuts later this year.